The Down Town Club is one of the Cescaphe's Event Group gorgeous wedding venues in Philadelphia. We have photographed weddings multiple times there, but every time we arrive at this venue, I fall in love with it over and over again. It is chic, classy, bright and welcoming. The Down Town Club's ballroom becomes even more beautiful when it gets dark outside and all the uplighting goes on inside. This wedding reception was styled in soft warm golden tones and shades. The walls' uplighting, the chandeliers, centerpieces, the wedding cake, everything was a result of meticulously thought through process of a great team of vendors who put all this beauty together. This photograph was taken almost in the end of the night as the cake cutting was the final key moment of the entire wedding reception. 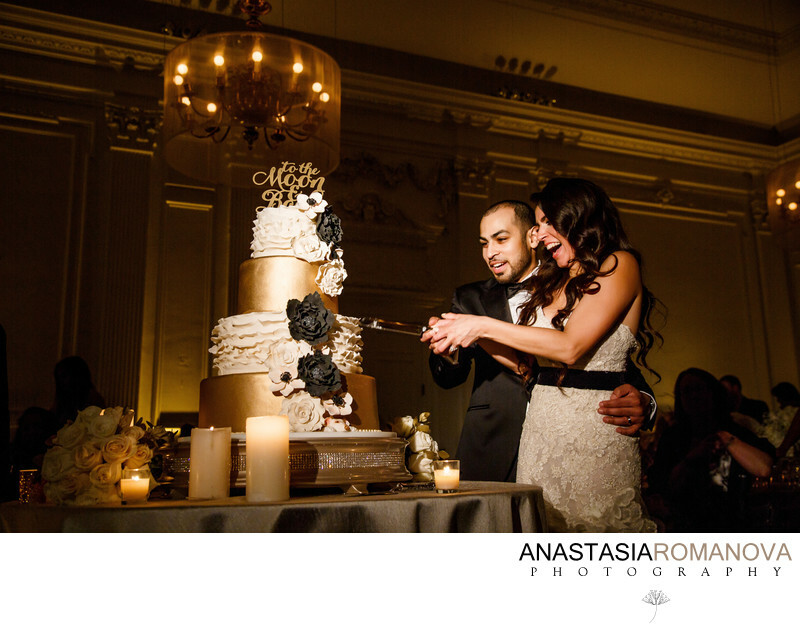 In order not to kill the ambient light coming from the candles around the wedding cake and just to highlight the couple, we used our Lowel-pro light directed at the bride and groom angled slightly to the right of the camera, which threw just a warm kiss of light on their faces and the cake. I absolutely love how all the beautiful colors fell together on this picture. But the most wonderful element on my opinion is the couple's expression and the emotion that make this image look so live and joyful.